Well, I can't really write anything about 26/11 that hasn't been written about already. Much of what we felt as a nation has been previously captured by the media, various columnists, conscientious citizens et all. Finally, what is left is a feeling of sadness, persistent shock and numbness by the events that unfolded over those three fateful days. But not so much at the loss of life and the general destruction. No, let me not kid myself. As someone from this violent generation of extremism, fundamentalism and misplaced bigotry, I am more than used to seeing gory pictures of death and violence on sensationalist national television and reading more of the same in the pages of newspapers. No, this is not what I am really upset about. What gets my goat is the fact that it takes us an attack on three five star hotels, 60 hours of soap operatic carnage and 180 deaths to get us to react the way we did. And that we need an anniversary to remember it again after a year. If instead, this would have been a routine blast (routine blast??? ), for instance, in a remote part of a tier 2 town, our reaction would most likely have been a shake of our heads, a resigned sigh and a change of channels (with a philosophical comment about how that's all we see on television these days). Because these attacks have, symbolically, been on middle-class urban India, our otherwise blase and narrow urban sensibilities have been jolted out of slumber. at all. At least, this way it’s fair. 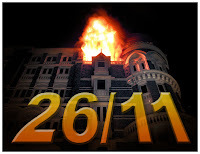 I feel not for those who died or who were injured in Mumbai during the 26/11 carnage, I feel for their fellow countrymen who have forgotten how to empathize. Or vote. Or care.